If you want you want to see our introduction to landforms, read it here. I created the description cards that you see in the photo. I love doing this and let Mavi read :) It is my way of letting him practice reading, not just in books. Now the transportation counters helped a LOT in my presentation. It helped me demonstrate where’s the land and water in the cards. Such a perfect tool for visual presentation! And they are so cute! They’re really worth-it! So here are my additional materials to help me with the topic. Here’s the 6 landform materials (out of 8). Aren’t they so beautiful? We’ll do more of this in the coming weeks as we explore countries and continents via Five in a Row. Hope you like this post! More geography activities from here: Follow Pinay Homeschooler's board Geography on Pinterest. As you all know, we are rowing books from Five in a Row (we are loving this so far!). This lesson in Roman Numerals is in line with the book The Glorious Flight (My son enjoyed every single page of this book! He even made a video narration of this book which you can watch here.). This is the first time Mavi encountered such numbers and he was surprised to learn that the numbers are represented by letters! I made use of our wooden Montessori number cards for this lesson and roman numerals handwritten on a paper (I ran out of printer ink!). We started off with the units (ones). He got the pattern right away and continued working up to the hundreds. We stumbled on the thousands as I myself was not knowledgeable of the the Roman Numerals in thousands LOL. We searched the web for the corresponding symbol for this. He worked on the rest of the numbers with less assistance from me and here he is so proud of his work! And now, if you are interested you can download your FREE printables of the Number Cards and Roman Numerals by clicking this link. Hope you find this helpful. Thank you! Don’t forget to like and pin this! More Math activities from my Pinterest board! We started Five in a Row late last week. If you have been skimming through my blog, I am a fan of this curriculum. Mavi was around 3years old, we did Before Five in a Row (Caps for Sale, Goodnight Moon, Going on a Bear Hunt) and both of us enjoyed learning through literature. If you want to know more about Five in Row curriculum, visit their website here. This 2015, I am including it once again in our homeschool. So last week, I came across Grandfather’s Journey in the library and I was a bit hesitant to start FIAR with this book (more of that in my book review). But because Mavi wants to read it, I gave in. It is the story about the author’s grandfather who moved to California from Japan. We read the story every single day before we would start our activities. Note that I did not purchase Five in a Row manual. Because of my location, I have no access to it and can’t afford the shipping cost. So what I did here is create my own activities that’s in line with the book and borrowed other activities from FIAR Moms as well. Expose your child to your genealogy! We talked about how the author Allen Say loves his grandfather and how close they are as a family. So I told Mavi that we are going to trace his family(maternal side) starting from my grandparents. Here’s how we worked them out. Mavi was enchanted by this activity. He enjoyed putting up together photos of his grandparents (and great grandparents!) and wished he knew his grandfathers even more. The story’s settings are in Japan and United States. So we traced how the grandfather travelled to California from Japan via a steamship in the Pacific Ocean. I have to explain to Mavi that long time ago, there were no airlines yet, so travelling is quite difficult. We explored the Japanese culture using our Asia in a Nutshell fact cards. Then we made kimono paper crafts which we printed out from Crayola. We also tried origami (the art of folding paper in Japan). Mavi’s origami was a flapping bird (in yellow) and mine was a crane (in red), and it WAS NOT EASY!! The chopsticks in the picture was from Japan, given to me by my brother (who also travels a lot!). We have not been to the United States yet. So he was interested learning about the famous landmarks that was mentioned in the story. We traced the places the grandfather visited in the story. The book did not mention any places but he only describes them. And that’s what we did, we looked for those places in the web and identified each of them. The grandfather travelled for 3 weeks to get to United States. As a review of his knowledge with the calendar, I asked him to arrange the months in a year. After which, we talked about the number of days in a month. We identified the months with 30 days, and those with 31 days. February is always a special month because it’s neither 30 or 31! Using the concept of multiplication (Montessori multiplication), we counted how many days did the grandfather travelled. In the story, it took him 3 weeks. So how many days are there in 3 weeks? Birds play a special role in the story. So we reviewed parts of the birds using Montessori concept. This Bird Puzzle can be purchased at Amazon or from Tower High Learning. We also checked our bird figure collections. This set is from Safari Toob Exotic Birds. How I wish I have the Backyard Birds so we can explore birds that you can find in your yards or at home. The cards are from here. You might also want to check our past activities on birds, Bird Unit. History: World War II I got Mavi some books about World Wars to give him a little bit of idea what it is all about. We would skip the rest of the topic and go straight to the war in Japan. Here I’m showing Mavi the effects of the nuclear bomb in Hiroshima and Nagasaki Japan. Usborne World Wars from Amazon. The Second World War (Young Readers series) from Amazon. I HIGHLY recommend this book. It is easier to read for a 6 years old and got lots of beautiful pictures. You can also get the books from Book Depository, Abe Books or Barnes and Noble. And that’s about it! Next on our list is The Glorious Flight and we’ll be exploring France, UK and airplanes! One of the most interesting continents to look into is Asia. Oh yes! It is the biggest continent and with some of the most interesting countries like China, India and Russia! 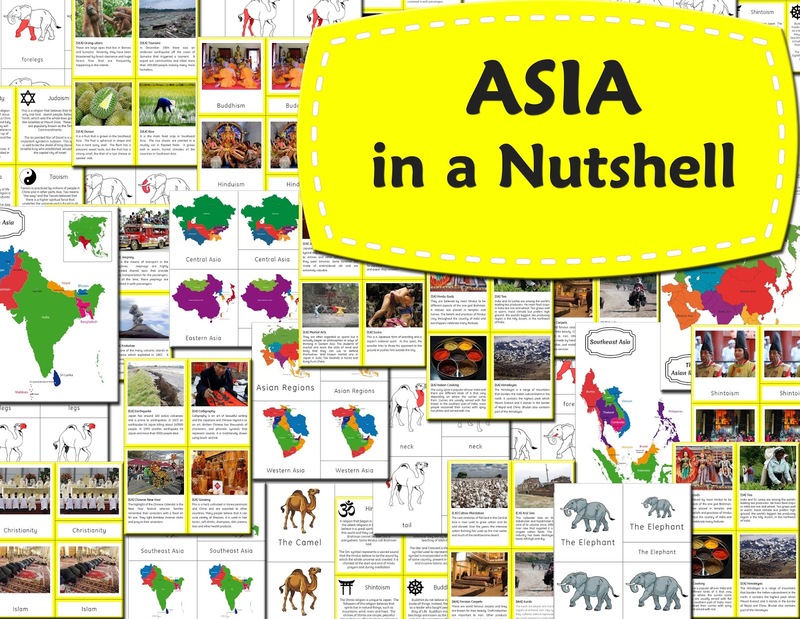 Now if you want to explore this wonderful continent in your class or home, checkout my ASIA in a Nutshell printable file. 1. Elephant and Camel Nomenclature Cards. Kids love animals! And while they are at it, introduce the different parts of their favourite animals. Elephants and camels are the two animals that are in Asia. Lots of learning opportunities here, learning how to match body parts, learning how to read… and more! 2. Asia Facts. When books and the libraries are not available, this is the best material to use in your Asia adventure! 44 fact cards that are filled with information about the people, culture, practices, food and economy of Asia. Your kids will definitely not be bored because each fact cards comes with a photo! 3. Religions in Asia. Yes! It is time that we should introduce our little ones about the different religions in the world! And where can we learn about it? Most definitely in Asia where there is a diversity of people, tradition and religion! When I introduced this to my son, he was mesmerized by the thought of having different religion! Come and learn about it in my printable. I provided nomenclature card and fact cards to describe each religion that has influenced a number of people. 4. Maps! And of course, the prerequisite of learning geography is learning the location and maps of Asia! As I said, Asia is a very big continent, and thus it was divided for political reasons. The map included here are the regional maps of Asia, with nomenclature cards. I am rebooting our Artist Study and we’re starting with portraits. Now this project was inspired by Leonardo da Vinci. See our previous activities with Leonardo da Vinci here. To know more about this genius artist and for inspiration, we first examine his life. We used this amazing book from the library, Levelled Biographies: Leonardo da Vinci[aff. link]. We enjoyed the book, and Mavi loved learning about Leonardo, not just as an artist but as a scientist as well. The book is appropriate for kids as it has a simple way of telling a biography and has lots of pictures in it. Aside from learning about Leonardo, we also talked about portraits. I showed Mavi random samples in the web. Then I took some photos of him outdoor to demonstrate what’s the difference between a portrait and an ordinary picture. (You can also do this with your kids!) After which, we started making our portraits. We used the DSS lesson for the tutorial and some inspirations. To create portraits, we used two mediums: oil pastel and tempera paint. Mavi wanted to use oil pastels (I never liked them!) as this is what they mostly use in school. So I guess he’s quite confident with it. As you can see I also tried creating my portrait using the pastel but the black which I used for the outline started to mess with my peach coloured face! I just have to stop because my portrait is starting to look messy. Second try, we used tempera paints. I like using paints! Easier to handle and less messy. Tempera paints, oil pastels and other art materials can be purchased through Amazon, Target or any craft store available. Mavi pointed out he doesn’t know how to make a nose and a mouth … so we’ll he'll be practising more. Now this is an activity that you can easily do with your kids. You can use any medium available, pencil, crayons or watercolour. Discuss what is a portrait and what do they imagine to be in that portrait. You can also talk about the back of your portrait, whether they wanted to be indoor or in the park, under the sun, the beach etc. Like my post? More activities here!